Birthdays on a Budget: Become a Follower! To learn more about the book, click on the picture above. Listen up, readers! 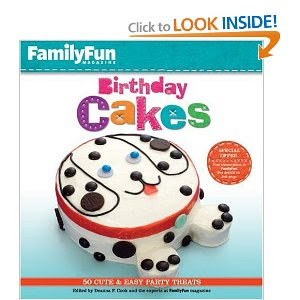 Anyone who becomes a follower of the Birthdays on a Budget blog (not the Facebook page) within the next week (March 9-16) will be automatically entered to win a free copy of FamilyFun's Birthday Cakes book- with ideas for 50 cute and easy party treats! Becoming a follower is easy- just scroll down on the sidebar until you see "Followers" then click "Become a Follower"- You'll be entered for a fantastic prize in minutes! If you have any questions, please comment on this post. Okay I stumped on ideas for my daughters upcoming mermaid/pirate party!! I have been running around trying to think of things that are cute and for a girl and boy( even though it is for my daughter I 2 younger sons and want the boys not to be left out please help lol thanks! !